I had heard about teaching kids to sign even before I became a parent. Once my son was born, I did some research and found that there was science behind the claims. One of the things I discovered was that, by teaching sign language, you and your child gain a closer bond. The ability to communicate with each other makes both parent and offspring happy. There are fewer tantrums because of this, and they develop stronger self-esteem just by being able to communicate which they can carry over into their formative toddler years and adulthood. You start to teach them the confidence they will need in life. You also start them off in a right place for reading. Signing starts the brain to understand the words sooner. Youngsters can build a more extensive vocabulary and develop a stronger ability to read, which in turns leads to better grades in school. Learning the sign language at an early age also ables a child to learn a second language easier. Being able to speak two or more languages is vital in this international economy we live in. Again, you will be helping to set your children up for success by learning to sign. These aren’t the only signs you can use. Sometimes, kids will create their own sign for a word. That is okay. Rotating the fists back and forth is the symbol for “change” like in diaper change. However, in our case, my son and I ended up using the waving hand in front of our noses to indicate his need for a change. The important thing is, as long as we understand the meaning of the sign, we stick with it. Learning sign language cannot be done overnight. I started my child off watching videos on the rug at about five months old. This tactic is not to get him started on television watching at an extremely early age, but to let him be used to the instructive videos designed to teach us sign language. They contained images and objects such as a cat or a ball and then speak the words while a kid did the sign for that object. The characters in the video repeated the signs and words several times before switching to a new one. My son and I repeatedly watch the video and I learn a few signs. It wasn’t until my son was about eight months old that I started seeing him use the signs. At around 10 months, he really started using them. He learned the signs for “eat” and “mommy” and “daddy” while some things the video taught didn’t stick, such as the signs for animals. But among the many signs we use. I love the most the way he would squeeze his hands for “milk.” That way, I could feel that we are indeed communicating and we understand each other. In introducing sign language to your kid, you have to be patient and not just rely on videos alone. You have to constantly reinforce the signs as often as you can. Repetition is vital for your child to learn them. Once your child starts using them, the stress will lessen. Teaching sign language to your child is not a fad. 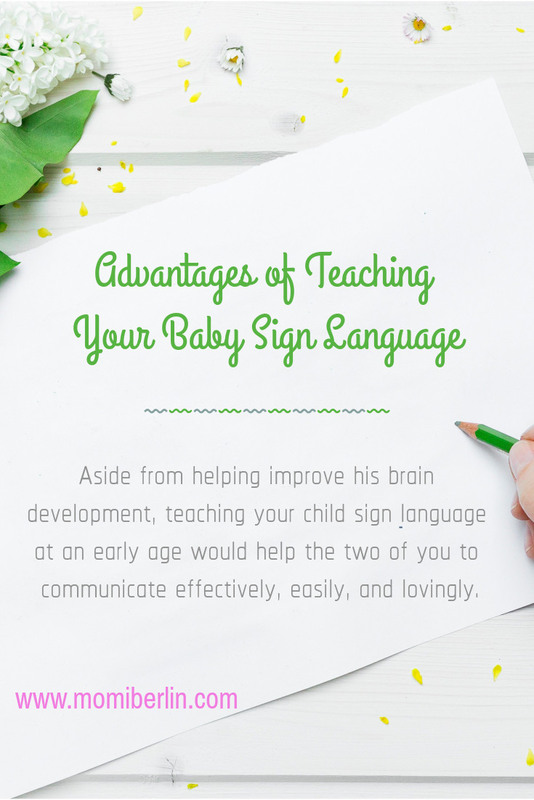 It is an excellent way to develop their little brains and help the two of you communicate. Be patient, be consistent, and keep it simple. Without you noticing it, you have given your kiddo an advantage that every parent hopes to give their children.